Sometimes when I’ve been writing for awhile and not getting anywhere, I feel the need to take a break and ‘accomplish something’. There are a variety of such ‘breaks’ to take and one that seems to crop up from time to time is ‘painting stools’ from my old classrooms. I’ve been trying to get them ‘spruced up’ to sell to raise money for publishing some of my books. 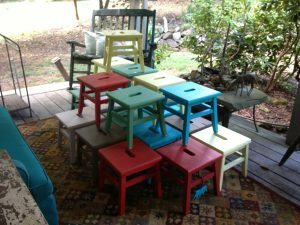 The stools are very sturdy and stackable to take up less space. I’ve become more fascinated with the process than the actual result. After cleaning them and sanding them over and over I’ve had fun painting them in different colors. First a primer, the one coat, more sanding, then another, layer after layer. Each sanding smooths the nubs and allows for the color to sink deeper and deeper into its being. I’ve moved them in and out of the house, to run from the raindrops and bird poop that threatens to add yet another layer to each stool’s story, ‘stool upon stool’ so to speak! Now they are finally ready for a final gloss finish and ready to sell!